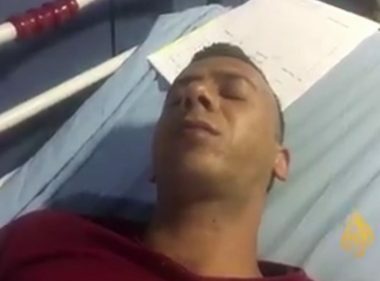 An Israeli colonialist settler shot, on Wednesday at night, a young Palestinian man, in Khirbat Qalqas area, south of Hebron, in the southern part of the occupied West Bank. The Palestinian Red Crescent Society said its medics rushed the wounded young man, identified as Bilal Za’tari, 28, to a hospital in Hebron, after he suffered a moderate gunshot injury in his arm. The wounded Palestinian was shot by the colonialist settler who was driving in the area, and tried to ram him, with his car, but when he failed in doing so, he stopped his vehicle and opened fire at several Palestinians, wounding the young man, before fleeing the scene. Eyewitnesses said the illegal colonialist settler opened fire at many cars near the entrance of Khirbat Qalqas, before fleeing the scene. After hearing the gunshots, Israeli soldiers rushed to the scene, apparently believing the shots were fired by Palestinian fighters, and deployed a large military force in the area and its surroundings.